the JSU Chamber Singers and the JSU Opera Theatre. 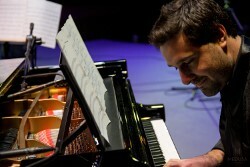 Born in Entre Ríos, Argentina, Barreto began his music studies at the age of 5. He dedicated more than 10 years to popular music as a keyboardist and pianist, embracing different genres of music such a Jazz, Rock/Pop, Latin and Argentine music. He completed his formal classical piano studies with the prestigious argentine pianist Graciela Reca. As a classical pianist, he has presented concerts and recitals (solo and chamber music settings) in various locations within Argentina and outside the country. Julio is a graduate of The Instituto Superior de Música - UNL (Santa Fe, Argentina), where he was awarded a degree in classical piano. Following this, he entered the Berklee College of Music (Boston, USA) and studied with Brian Lewis, Ben Newhouse, Jeri Sykes, Dan Moretti, and Jerry Gates, earning the Master Certificate in Arranging and Orchestration. During this time, he was awarded the Herbie Hancock Celebrity Scholarship, in recognition of his academic achievement. He also attended to the Summer Programs in Berklee and studied Piano with Neil Olmstead, Russell Hoffmann, Kevin Harris, Robert Christopherson, Utar Artun, Leo Blanco and Vladan Milenkovic. His musical activities include diverse areas such as session musician, composer/arranger/producer, as well teaching in public and private institutions. He also has performed with several international musicians such as Paquito D’Rivera, Greg Haynes, Sandoval Moreno de Oliveira, Joel Frisch, José Dávila, Thomas McCutchen and Nilsinho Amarante. Julio was teacher and accompanist pianist of the “Choral Institute of the Province of Santa Fe” school of music (2013-2017); in addition, he worked at the piano department, teaching Complementary Piano and Piano Accompanying, and was Director of the School Extension Department (2014-2018) for the Instituto Superior de Música - UNL (Santa Fe, Argentina), the school where he also taught the “Popular Music Improvisation Seminar” and the seminar on “Rock and Pop: Interpretation, Arranging and Production”. Since 2015 Julio was the pianist of the “Santa Fe Jazz Ensemble” Big Band, and the group “Picante Latin Jazz”. Currently he works as a Visiting Assistant Professor in the Music Department of Jacksonville State University, teaching Class Piano, Applied piano lessons and as an Accompanist for the JSU Civic Chorale, the JSU Chamber Singers and the JSU Opera Theatre.